For the fastest, most efficient service possible, put down the roll foil and turn to these 9" x 10 3/4" food service aluminum foil sheets! 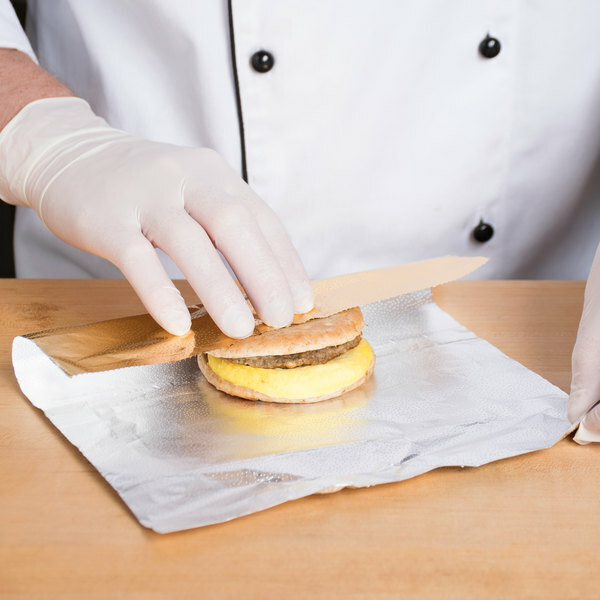 The high-quality, interfolded pre-cut sheets are perfect for use when wrapping hamburgers, hot dogs, sandwiches, baked potatoes, and so much more. With one gold side and one silver side, these sheets give you the versatility you need for instantly identifying multiple menu items. Use them at your concession stand, fast food restaurant, or snack bar to save the time and the hassle associated with unrolling and estimating sheet sizes from traditional foil rolls. Since these sheets come precut, in a pop-up style box, you'll always have a consistently-sized sheet at the ready. The pop-up design ensure sanitation, with your staff only touching the sheet they need at the time of service, while the large sheet count per box reduces the need to stop for a new box. Perfect for baked potatoes, and traveling with them. Keeps the potato hot and most. Also can be used to wrap small square pans and label with a sharpie. 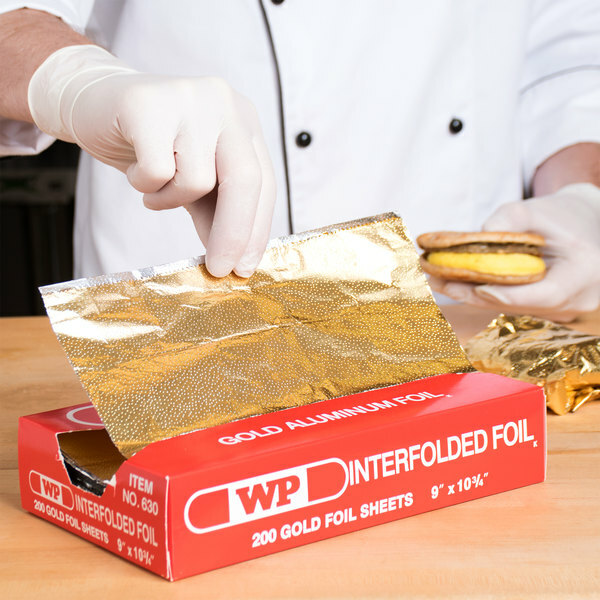 Great gold wrappers, better price and quality than others I’ve used. I use them for wrapping chocolate Hershey bars for favors for weddings and birthdays. Excellent quality, love the gold option. We used them at a tailgate party to wrap hotdogs, which looked nice and kept them warm. Great for lining pans too. In love with these! The choice is mine. Do I want gold? Do I want silver? The choice is mine and I choose gold most of the time! These foil sheets really kick it up a notch! I absolutely LOVE these foil wraps. Like some others have said, they are a bit more pricey, but they work great for us. In our concession stand we sell both hot dogs and brats. These foil wraps make it so much less trouble remembering which item you have wrapped. We use the gold side for brats, and the silver side for hot dogs. With having teenagers work in the concession stand, makes it much easier to see at a glance what you are putting in the warmer, so you put them in the right place. I wish they came in a larger quantity box. Great pop up foil sheets for baked potatoes and small items. I would have rated 5 star if the foil sheets were slightly thicker in size. More expensive than silver foil but beautiful if you're making a packaging statement. Excellent, as far as foils go! Wraps easily, is the right thickness for sandwich / taco wrap, etc. Wish we could get it in larger box quantities...! Makes a better presentation for catering or so special orders other than the silver foil. Would recommend for the companies that would like to take a step up in presentation! 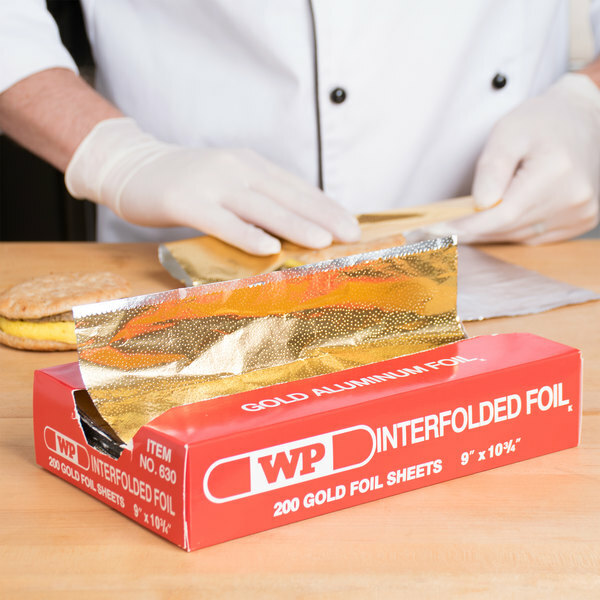 Foil sheets are a real time saver in the kitchen. Having the option to go with gold or silver sides gives us versatility and makes a nice impression with customers. We order these by the case. The gold color is a bit more orange looking than we would like, but it's far from a deal breaker. Recommended product. Love this stuff! Great for breakfast burritos and looks better than typical foil. I also like to use it to line to-go boxes so it looks a little nicer! these are great for my concession stand. it helps keep our food warm. easy for my 11 y/o daughter to use when she helps out! and the dual color gives a better presentation than standard foil color! Perfect size, great price. These are essential in our daily to-go business. Durable & convenient size & dispenser. Very happy with these sheets, will be a constant in our inventory. I like the gold of these sheets, which give a fancier look to anything wrapped in them. We use these to wrap our "bacon candy", and it's like unwrapping a delicious gift for the customer. These are GREAT!!! I used them at a carnival themed party for my nephew to wrap up turkey legs that had been grilled. They were the perfect size and keep the turkey legs warm until time to eat. I love the Gold Interfolded Aluminum Foil Sheets. They were really easy too work with as I used them too wrap all my Hot Dogs and Sausages at my Hot Dog Cart last year. All of my customers really liked them. Thanks Webstaurant Store for a Quality product! 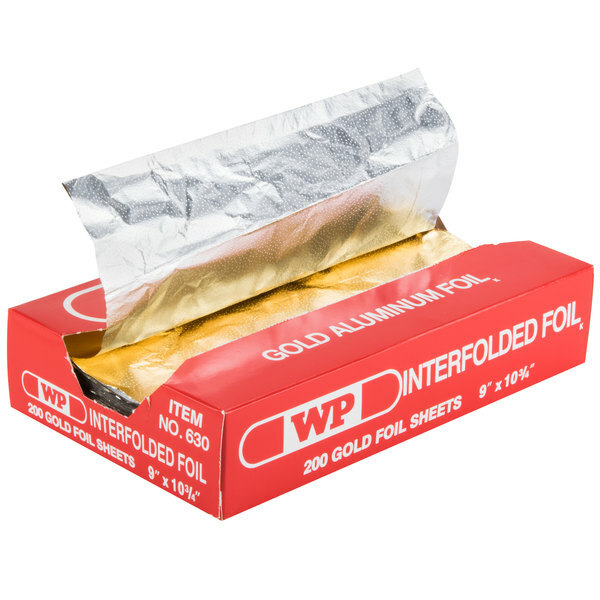 The pre cut 9x10.75 gold Interfolded foil sheets,ar great for wrapping sandwiches for take out.The kids realy like the gold,It comes in 200 sheets per box. 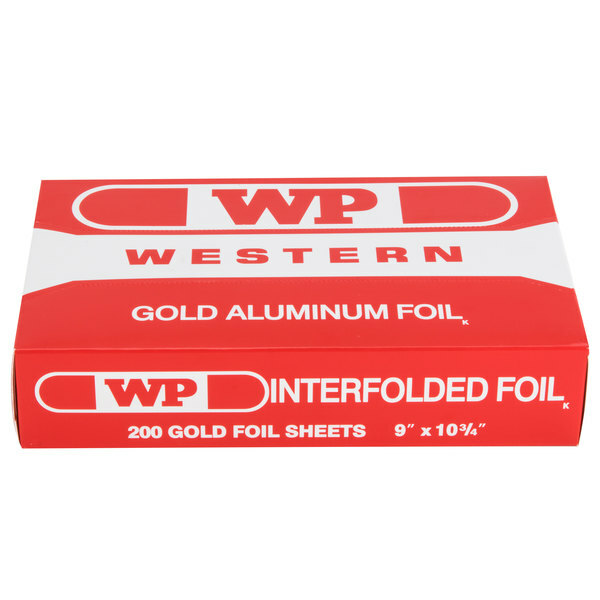 I'm using these foil sheets to wrap hot dogs and breakfast burritos taht I sell from my hot dog cartand they work great! They are easy to use and my customers appreciate them as they effectively hold in all the toppings and keep things warm and fresh (especially to go items. We have a client who uses these for their take-out sandwiches. Customers are always really impressed with the gold foil - because you always see the silver out there but the gold is pretty rare.